As an experienced driver, you will agree that a well-serviced and maintained Subaru could go for thousands of miles as compared to that which is lesser serviced. With just basic regular service, repair, and maintenance, your Subaru can easily surpass your expectations. Getting the right Subaru service, repair, and maintenance center is a crucial part of keeping your vehicle in good shape. At Santa Rosa Transmission and Car Care, we offer excellent Subaru service, repair and maintenance and a whole lot of additional benefits for Subaru owners all across Santa Rosa, CA. Other additional benefits include a convenient business center, straightforward pricing, stress-free environment, comfortable waiting space, convenient business hours, monthly service specials and much more. It is an honor for Santa Rosa Transmission and Car Care to serve a wide range of drivers with their Subaru service repair and maintenance needs. Our discounts on service, repair, and maintenance are quite popular with our California customers who take advantage of such offers at Santa Rosa Transmission and Car Care. 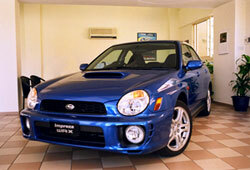 Being a professional Subaru expert, our services and offers cannot be matched. Our services will guarantee that your Subaru goes a long way, therefore, protect your investment by scheduling an appointment with us today. Nonetheless, if you are in doubt as to whether your Subaru needs any repair, or maintenance service, the maintenance schedule on our website can act as a guide. Moreover, if you have further questions or inquiries feel free to contact our customer service department who will promptly respond. You can make your service appointment online today for convenience purposes and experience what Santa Rosa Transmission and Car Care has to offer.